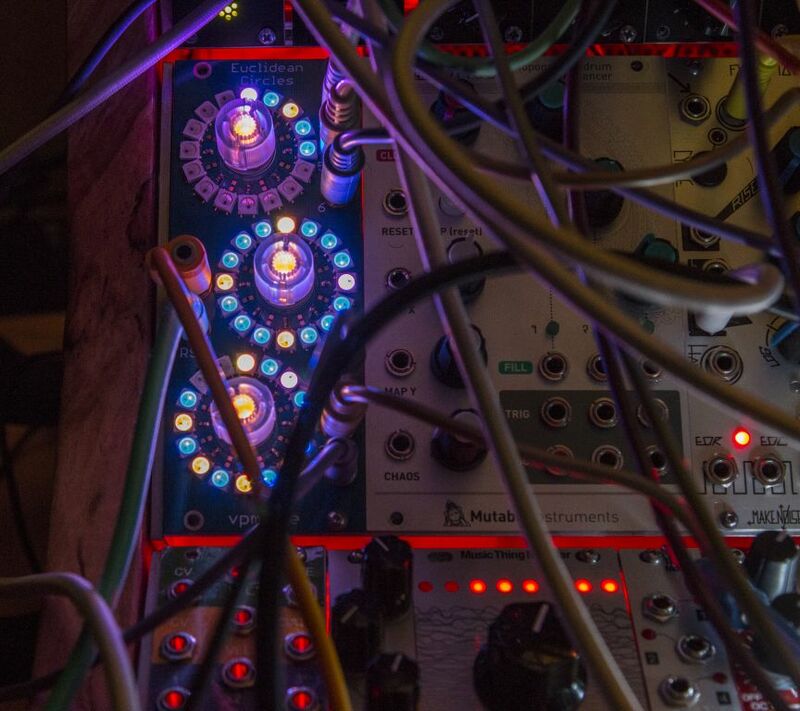 What a blast this new module from Vladimir is! Within minutes of it being powered up I had funky syncopated jams going that were so much more fun to wiggle with than either of my other pattern generators (see the lonely Grids sitting next to the Shiny new Euclidean??). I'm driving pretty much everything in this patch with Euclidean Circles. The only other clock is a tempi division running the Y Clock on Rene. One of the cool things about EC is there are two outputs for each pattern. The selected beats and then the NOT selected gates. I'm driving bass drum and bass synth with Ch 1 (and 4). Snare and Rene X lead sequence with Ch 2 (and 5) and Hihat and Bongos (Rings) with Ch 3 (and 6). You can also program them all individually if you prefer on two pages for the three dials. I have pre-set the amount of divisions and the start point (offset if you will) for each of the three channels. I'm only wiggling the number of On beats for each dial to create the variations you hear on this piece. Sorry the video is kinda crappy but I was trying to find a setting to make the wonderful multicolor LED's on EC show up in the final video.. (didn't do so great). 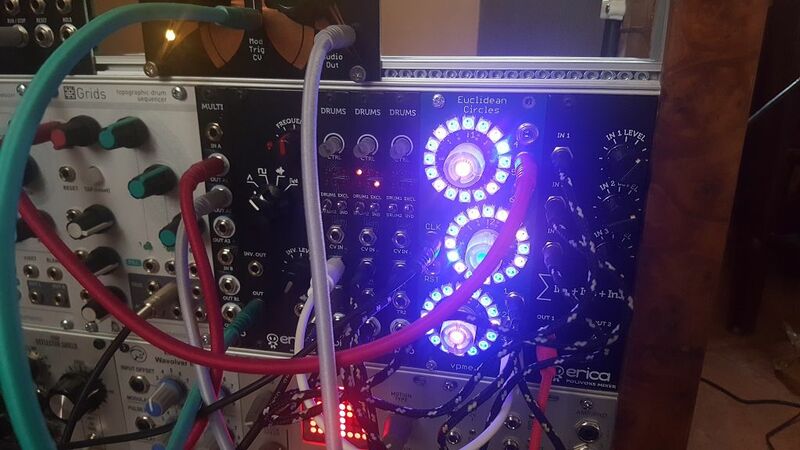 The module is BRIGHT!! I have the Led's one notch above the darkest setting (1-8 I believe). Anyway, this is a fun, easy to use, versatile module that generates great patterns in a hurry. It's well made and a ton of fun to watch!.. hope you enjoy this. very cool. I was just searching for info on this module the other day. also, hello fellow westchester guy! Looks like a really neat interface. Maybe it needs a filter layer over those LEDs? Probably can DIY one. Where in Westchester are you?? PM me.. There's also a brightness trim-pot on the PCB if I recall. This looks great - thanks for the demo vid. Very interested in this. I'm very interested in this but I don't know where to buy it. Check the first post of the thread in the DIY forum, he sells boards in various states of completion as well as fully built. 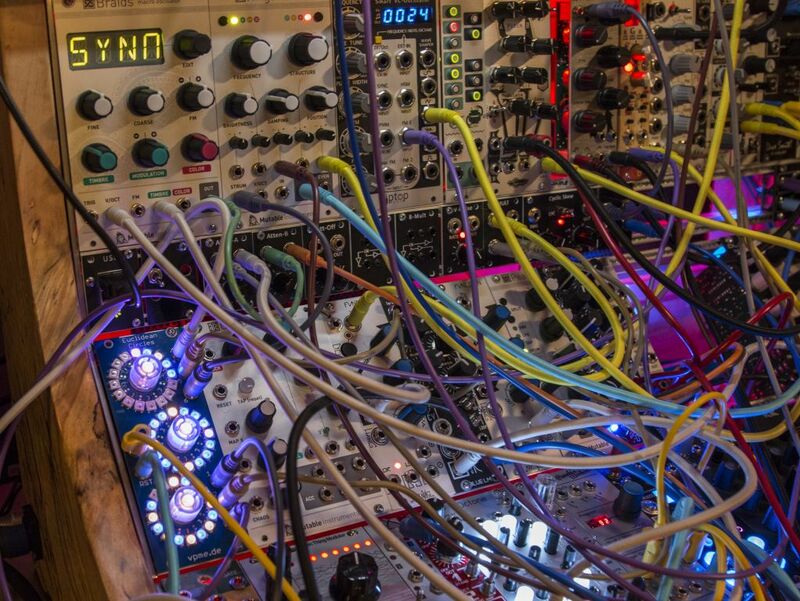 Cool demo franman69, you probably just helped sell a bunch of modules! Just FYI..by the time I purchased the PCB/SMT kit plus parts it was only 30-40Eu less than buying the completed and tested module. That's the way I ended up going. and Vladimir was great to deal with also!! After reading The Geometry of Musical Rhythm by Godfried T. Toussaint(the man who started using the euclidian algorhythm for making world beats) i always wondered why no one has done a trigger sequencer with the circles as he depicts in his book. I've got a Trigger Riot in the post but man i want this one too!! I ordered a pre-built from Vladimir after seeing this vid. Nice guy to deal with. How did you get it to not double trig ? The ND1 I mean. @Hallmar, I have one for you too! for makIng me a circles!! it's a an awsome bit of kit. it's got six outputs and my pico drums have six inputs. I love it. so nice to look at too!! Still don't know what Euclidean even means...sounds great though.